As part of the project to represent Stirling Palace launched by Historic Scotland in 2001, weavers from the renowned West Dean Tapestry Studio have been undertaking the reproduction of 7 tapestries depicting the Hunt of the Unicorn that are to line the walls of the newly refurbished Queen’s Inner Hall. Some of the tapestries, which are a contemporary interpretation of a Renaissance set depicting the Hunt of the Unicorn in The Cloisters Collection, the Metropolitan Museum of Art, New York, are being woven on site in a purpose built studio within the castle grounds and as part of our Understanding Textiles course we went to see the weaving in progress. We had been looking forward to the trip since term started and it was nice to finally have some time out in the sun, even if it lasted only a short while! – the Stirling tapestries have been woven with 4 warps per centimeter, instead of the 8 warps per centimeter with which the original tapestries were woven. 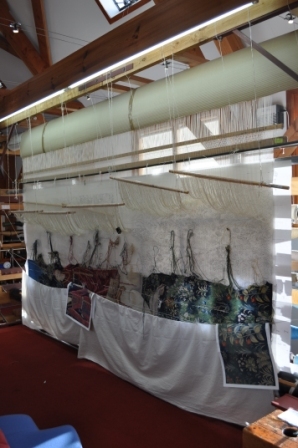 – The tapestries have a cotton warp with wool and cotton wefts. It is woven horizontally. – Weavers work from the front of the tapestry for the benefit of the tourists as public engagement has been an important part of the project. They work to a black and white design called a ‘cartoon’ which sits behind the warp. – yarns are dyed with chemical dyes instead of vegetable dyes, as they will not fade as quickly. The colours of the yarns used were colour matched to the back of the original tapestries. It was found that there was a large variety of colours used on the Hunt of the Unicorn set in the MET suggesting some of the dyes may have been procured from abroad, a reflection perhaps of the wealth of their original owner. – gold wrapped threads with an orange core are being incorporated in places where silver metallic threads were originally used. This change was made on both aesthetic and conservation grounds. The original silver metallic threads have since tarnished and using gold wrapped threads would prevent this while also contributing to the majesty of the overall image. Ruth explained that as well as being aesthetic, the differences were driven by economics factors: understandable given that the original tapestries would have taken 24-30 years to weave! Once completed, the tapestries are lined with a downproof cotton and hung with Velcro®. The lining is used as a barrier between the tapestry and the environment. We were then escorted to the Queen’s Inner Hall where the 5 completed tapestries are on display. The tapestries cover different aspects of the Hunt of the Unicorn, which tells the story of the unicorn being hunted and killed by men and dogs. The imagery can be read as an allegory of love and Christ, in particular the ‘Christ in paradise’. The unicorn was believed to be a powerful and mythical beast but also symbolised purity and in this context would have affirmed the Queen’s right to rule. Recognisable faces were often woven into tapestries and as a nod to this the weavers of the Stirling tapestries have included the faces of some of the staff as characters woven into the tapestry. Following this, we joined what was possibly the most animated tour of the castle grounds! And with that, our time at Stirling Castle was over in flash, but there is no doubt that some of us will be making a return trip in the near future. For those who can’t make it up to Stirling, there are some useful factsheets about the project available online and some fascinating aspects of the project are explored in a paper entitled ‘Rediscovering the Unicorn tapestries’ by Caron Penney published in Authenticity and Replication: The ‘Real Thing’ in Art and Conservation.